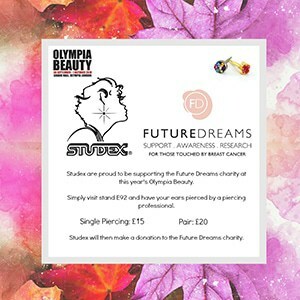 With October being Breast Cancer Awareness month, Studex Ear Piercing are proud to be supporting the Future Dreams charity at this month’s Olympia Beauty Show. For all Ear Piercing Treatments carried out over the two days we will make a donation to Future Dreams which raises funds to support women through their breast cancer journey. Future Dreams is striving for a future free of breast cancer through raising vital funds for breast cancer support, awareness and research. Visit Studex on stand E92, pay for an ear piercing (£20 for a pair, £15 for a single piercing) and we will make a donation to the charity. Using the System 75 piercing system, you can be guaranteed a safe, sterile piercing from one of our experienced piercing professionals. The system uses jewellery quality earrings with a beautiful selection of styles available in 9ct Gold and White Gold, 24ct Gold Plated, a surgical grade of Stainless Steel and Titanium to choose from. All piercing earrings are pre-sterilised in cartridges designed for touch-free loading and disposal, ensuring safety for both the Operator and Customer. We look forward to welcoming you to the stand to help us support such a fantastic charity. About Studex UK: As the world’s largest manufacturer of Ear and Nose Piercing equipment we have a lot to offer you and your business, fully supported with certificated training from our highly experienced Trainers as well as a top rate Customer Service Team.